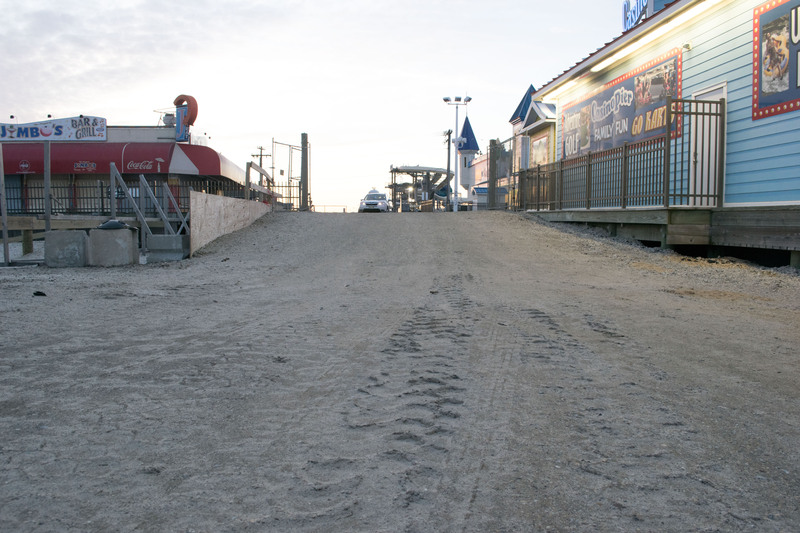 Seaside Heights’ beach replenishment project – now completed except for new beach entrances, which are under construction – will come with a few changes to the oceanfront and its access. The duneline now sits in front of the boardwalk. But between the boardwalk and the start of the dune, there is an area of slightly lower elevation. This could produce extra work for the borough this summer as any trash that gets caught by the wind could end up getting “stuck” there, necessitating more work on the part of public works crews to keep the area clean. Borough Administrator Christopher Vaz said the town is under discussions with a temporary employment agency that could provide labor to provide coverage 22 hours per day (from 4 a.m. to 2 a.m. the following morning) to handle the extra work. 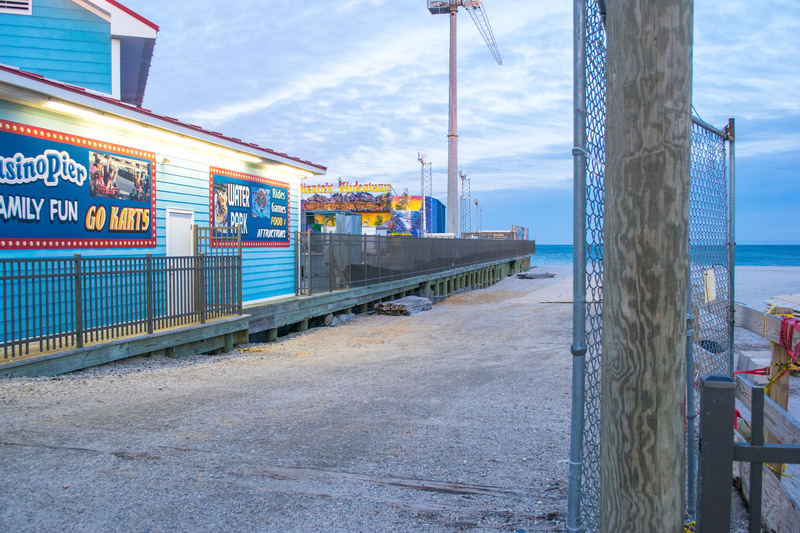 The agency is being considered because Seaside Heights, unlike most employers, the directly responsible if a seasonal employee files for unemployment benefits. An agency would handle that cost as well as workers’ compensation claims and other administrative tasks. The borough will not consider “J-1” visas for seasonal employees, which allows students from abroad to fill seasonal jobs. To help alleviate the problem before it starts, the borough will install more than 100 signs advising visitors to stay off the dunes and refrain from jumping over fences or littering. The signs are being provided by the state Department of Environmental Protection. The borough is also readying a project that will allow the town to maintain vehicles access to the beach at the main access point at Grant Avenue. Because it will be the one area that cannot be protected by an engineered dune, the borough is looking at final plans to install a flood wall that would allow for vehicles to cross the boardwalk (for emergencies and special events) yet still provide ample protection for businesses around it. “It’s going to probably involve a lot of construction there to get it right,” said Vaz, estimating it will take 4-6 months. The borough will complete the project after the summer season. 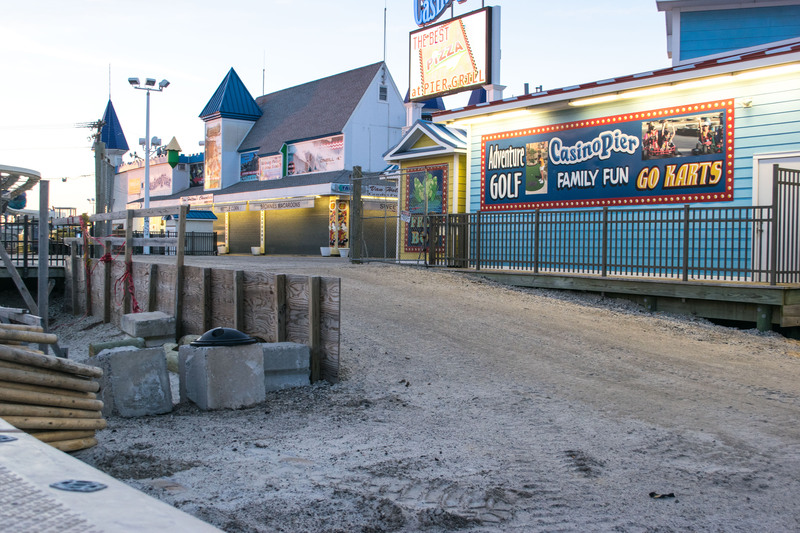 Protective measures in front of Casino Pier – upping the grading of the beachfront – were completed last week. Vaz, the borough administrator, said dune grass will be planted in about three weeks, depending on weather. The sand must not be in a frozen state in order for the plants to take root, though they can survive winter weather. “The dune can’t be hard because the machine they have to make the plug into the sand requires soft sand,” he said. Officials are also looking into snow fencing around the new dunes that will help build up sand over time and keep blowing refuse off the dunes themselves.